We bring you the fourth of a 14 part series of extract from the Morphogenesis Architecture Monograph, to give you a peek into the mind space of one of India’s best recognized, sustainable design practices. 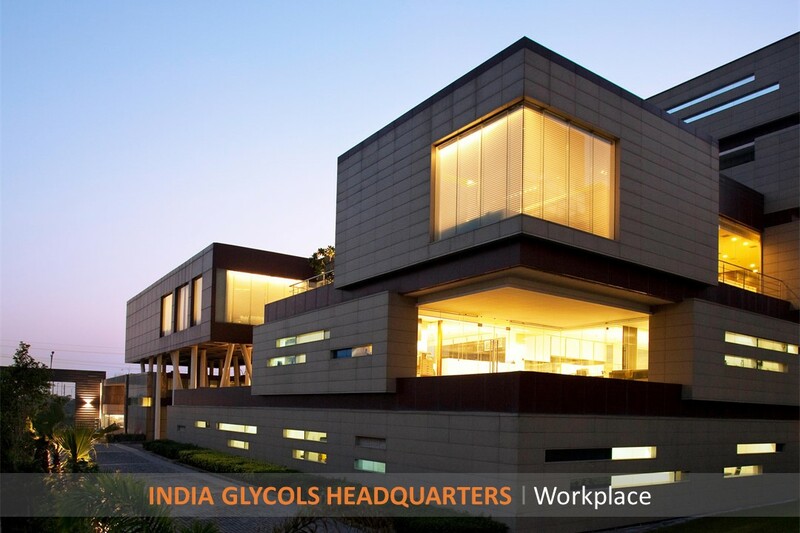 “The headquarters for India Glycols Limited sits on an expressway in Noida, a suburb of New Delhi. The morphology is inspired from the ancient development of Fatehpur Sikri, near Agra. The serene interiors are designed as a series of courtyards enclosed within the fort-like external walls. The introverted scheme acts as a heat shield to protect from the harsh climate and bleak exterior views. This building addresses energy, heat and lighting from a sustainable perspective – economising on the first, defeating the second and optimising the third. The opaque exterior walls contain within them Jenga-like juxtaposed volumes, which house the workspace and are seamlessly integrated with the central landscaped courts. This inside-outside connect is strengthened by raising the outer landscape to the ‘work-desk’ level. The office complex demonstrates that even with a need for seclusion, workspaces can establish connections with the outside.